I went into Coco slightly concerned for many reasons. First, the movie deals with death, a subject that might be difficult for children to understand. Second, it has a Mexican background, and far too often I, as an American of Mexican descent, have seen even well-meaning attempts at cultural respect turn into embarrassments. Third and finally, the title, which I think is not particularly good. 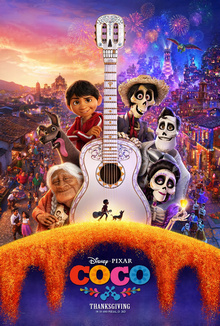 Well, my fears are mostly for naught, as Coco is a charming and delightful film, respectful of Mexican culture (even if it isn't exactly how I remember it); while not without its flaws, Coco moves one and opens up the wonders of Mexican culture to a wider audience without losing the larger audience (though again, since I'm familiar with this world, I may be a poor judge of how it translates). Miguel (Anthony Gonzalez) comes from a long line of shoemakers, the Rivera family adopting this ever since his great-great-grandfather abandoned the family to pursue a music career. As such, his great-great-grandmother Imelda banned all music, something that was carried on by his great-grandmother, Coco, and fiercely carried on by his formidable Abuelita (Renee Victor) ('Abuelita' translating to 'Little Grandmother', as 'Abuela' is 'Grandmother'). As a side note, I can vouch for the formidable nature of older Mexican women, though I always called my Grandmother 'Abue', but I digress. There's just one hitch: Miguel loves music and secretly plays the guitar. Moreover, he is devoted to the memory of Mexico's greatest singer/songwriter, Ernesto de la Cruz (Benjamin Bratt), who is vaguely like Mexican superstar Pedro Infante. Abuelita is infuriated when Miguel's secret is discovered, and the whole family is upset when he will not join them for the traditional Dia de los Muertos (Day of the Dead) commemoration, involving the living members going to the cemetery to honor their deceased ancestors. The stray dog Miguel has informally adopted has caused damage to the family altar, where photographs of the dead Riveras are. When Miguel finds the photo of Coco's parents damaged, he finds that the folded piece is that of De La Cruz's guitar. The face was ripped off, so could Miguel be related to the Idol of Mexico? With that, Miguel breaks into De La Cruz's mausoleum to take the guitar, but a single strum finds him in the Land of the Dead. There, he meets all his ancestors save for Imelda, because her photo is not on the altar and thus she cannot cross. This leaves this other formidable Mexican female specter cross, and while his ancestors are willing to help Miguel return to the Land of the Living, Imelda's condition that he give up music is too much. Needing the blessing of a relative, he decides to seek out De La Cruz. Into his journey comes Hector (Gael Garcia Bernal), who strikes a bargain with Miguel: he will get him to De La Cruz's big show in exchange for Miguel putting Hector's picture on the family altar before he is forgotten and disappears forever. The rest of Coco involves their adventures, the dead Riveras trying to track Miguel down, and revealing the mystery of Ernesto de la Cruz and his connections to the Riveras...and to Hector. In the end, when it is a year later, the Rivera family (living and dead) not only reconciles but also has a new appreciation for each other and the music they make. Coco, who has finally passed on, is now with her parents in the Land of the Dead, and both sides ready themselves to reunite once more. Coco has a most universal theme: that of family and tradition and the importance of it. These themes transcend culture, which is why the film has been so successful across the United States among people of all ethnic and racial backgrounds. You don't have to be of Mexican descent to appreciate the love of family (though I think it helps). In terms of animation, Coco is breathtakingly beautiful, the full vibrancy of the colors so overwhelms you: the lush brightness so indicative of again, Mexican culture (a side note: I've yet to be in a Mexican-American home that didn't have a brightly colored kitchen...and mine's yellow, in case you wondered). The physical appearance of the living is so well-crafted that the figures look almost like figures rather than even computer-generated models. Coco is a rich film visually, one that overwhelms you in a good way in the detail and looks. There are various nods to famous figures of the Golden Age of Mexican cinema that may fly over non-Mexican audiences (Hispanics, being such a disparate group, won't all uniformly know all the figures). Ernesto de la Cruz seems an amalgamation of Mexican film stars Pedro Infante with a touch of another (still-living) actor/musician: Vicente Fernandez. At De La Cruz's shindig, he introduces Miguel to the real Infante and his contemporary, Jorge Negrete. Other Mexican film stars like Cantinflas and the formidable Maria Felix (better known by her sobriquet La Dona or 'The Lady') along with the equally formidable Frida Kahlo (Natalia Cordova-Buckley) also pop up. You even get a skeleton version of EDM DJ Skrillex at the Land of the Dead concert, which unsurprisingly leaves the dead extremely confused and not overwhelmed. Interesting that I keep using the phrase 'formidable Mexican woman'. Must be because of my Mexican mother, who is loving...but formidable. Yet again I digress. It was a wise decision to cast a Hispanic cast to fill the voices save for John Ratzenberger, but a Pixar film without him is unthinkable, so I use my Mexicanism to make him a son of the Aztecs. Because we all are charmed by the bright colors and wonderful message about the importance of family, of tradition, and of remembering those who have passed on, I think we forget the flaws in Coco, and there are some. The 'twist' in Matthew Aldrich and co-director Adrian Molina's screenplay (with a story by them, Lee Unkrich and Jason Katz) is so obvious that I wrote in my notes early on, "I hope X isn't (Miguel's) great-great grandpa". I'm genuinely surprised that people could not figure that twist because it was so obvious (the audience I saw it with laughed out loud when the 'twist' was revealed). You also forget Coco has a major part of the plot a murder, which I'm surprised hasn't shocked more people dazzled by the pretty colors. Add to that what appears to be something of a standard scenario in Pixar films: the seemingly benevolent figure that turns out to be anything but (shades of Lots O' Huggin' Bear and Prince Hans here), the inevitable rush to stop the villain, the apparent lack of resolution only to find a variation of a Deus Ex Machina. Coco has great music, but I do not think is has a standout song in the way You've Got a Friend in Me or When She Loved Me were. There were only two songs that I remember: Remember Me, the one I think being pushed for recognition, and Un Poco Loco, which Miguel and Hector perform to win a chance to go to De La Cruz's big shindig before his main annual concert. Remember Me is nice, Un Poco Loco upbeat, but I'm hard-pressed to really recall them, let alone sing them long after I left. Despite the obvious 'twists' in Coco, I was charmed by it and yes, I did shed a tear or two at the end. I leave with some personal observations as an American of Mexican descent with regards to Coco. I think the Riveras are more rural than urban, with the traditional offerings to the dead on Dia de los Muertos not as extensive in the city than in the country. I've never built an altar myself, though on Dia de los Muertos (or thereabouts) I do place flowers on the graves of those whom I knew when they were living, mostly relatives but some friends. I may not have an altar, but in my study, on top of my old record player, are photos of my ancestors, most of them gone but not forgotten and still loved. Coco is respectful of Mexican culture while also multicultural. Bright, shiny and beautiful, but with a plot that isn't as clever as it thinks it is, the film charmed me and moved me. It's a simply wonderful film. And one more thing...never try to challenge a Mexican woman, unless you want to go to the Land of the Dead quickly.